We find in this book, that even those Jews who were scattered in the province of the heathen, were taken care of, and were wonderfully preserved, when threatened with destruction. Though the name of God be not in this book, the finger of God is shown by minute events for the bringing about his people's deliverance. This history comes in between #Ezr 6; 7|. 1-9 The pride of Ahasuerus's heart rising with the grandeur of his kingdom, he made an extravagant feast. This was vain glory. Better is a dinner of herbs with quietness, than this banquet of wine, with all the noise and tumult that must have attended it. But except grace prevails in the heart, self-exaltation and self-indulgence, in one form or another, will be the ruling principle. Yet none did compel; so that if any drank to excess, it was their own fault. This caution of a heathen prince, even when he would show his generosity, may shame many called Christians, who, under pretence of sending the health round, send sin round, and death with it. There is a woe to them that do so; let them read it, and tremble, #Hab 2:15,16|. 10-22 Ahasuerus's feast ended in heaviness, by his own folly. Seasons of peculiar festivity often end in vexation. Superiors should be careful not to command what may reasonably be disobeyed. But when wine is in, men's reason departs from them. He that had rule over 127 provinces, had no rule over his own spirit. But whether the passion or the policy of the king was served by this decree, God's providence made way for Esther to the crown, and defeated Haman's wicked project, even before it had entered into his heart, and he arrived at his power. Let us rejoice that the Lord reigns, and will overrule the madness or folly of mankind to promote his own glory, and the safety and happiness of his people. I want to embrace this book of the Bible , I really do I used to think was illegitimate for reasons of not even mentioning ‘God’ Have realized that the Sacred Name may be in acrostic, whether in King James English or the Hebrew manuscripts or both, I know not. Only would love to find His Name ‘hidden’ in the text. Verse 17~The bad decisions of those in power can have a bad effect on those who associate with them or are under their power. Verse 12: Vashti did not have respect for her husband and this led to her downfall. The first time I read Esther, I was inspired beyond words. The obedience of Esther to Modecai, her humility to Hegai, and her strong faith in God. I saw where God used something out of nothing and made something out of it, to the glory of his name. if we trust in him, all things are possible. I am currently writing a short story for children on Esther, so as to inspire them as it has inspired me!! God always has a plan and a way of escape for His people.This happened in order for Esther to come in .At the same time it's still a lesson in ch. 1 WIVES HONOR YOUR HUSBANDS..God is a God of order..
We all have to have faith that is stronger than the fear of death; otherwise we won't make it. God knows our faith and He WILL test it in this life. A month ago I came down with a combo of flu/pneumonia. I was in hosp. for 7 days, sick at home a week before that. In hosp. God told me He was using me in answer to my prayers for my husband's salvation. Then I REJOICED for my trial. Esther is one person that when we get to Heaven, I shall seek out. She has always been a source of inspiration for me when I have had to face the "Haman's" in my life. She not only ruled well, she believed well. She is a role model for all women who love God and are faced with a situation where we need courage, in spite of our fears. My mother read this story to me as a child. I never forgot. What Do You Think of Esther 1? 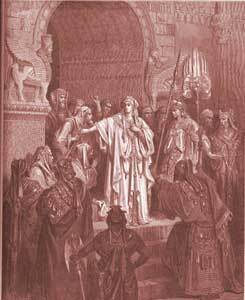 In the book of Esther what was the name of the Queen that refused to be summoned by King Ahasuerus (Xerxes)?